UN Special Envoy to Syria Staffan de Mistura has resigned effective at the end of this month, after four years on the job. So what is new or surprising in this resignation, since de Mistura replaced Algerian veteran diplomat Lakhdar Brahimi in 2014, who also resigned after trying in vain to broker a peace settlement in Syria. Brahimi had replaced the late UN chief Kofi Annan, who had decided to quit his mission on behalf of the international community after only six months of handling “mission impossible”, as he put it. Sure enough, negotiating a peace settlement of the Syrian conflict has turned out to be a truly mission impossible and the world at large knows why! Syrian Deputy Foreign Minister Faisal Al Mekdad welcomed the appointment of the new envoy, veteran Norwegian diplomat Geir Pedersen, and promised to work and cooperate with him on condition he does not repeat the “mistakes” of his predecessors! Of course the whole world knows all about the “mistakes” of all the UN special envoys on the Syrian conflict since they all refused to budge on what it would take to end the Syrian civil war. All the envoys wanted to bring the Syrian conflict to an early resolution by reintroducing pluralistic democracy, rule of law and respect for human rights in Syria. Nothing more and nothing less. Damascus never reconciled itself to accept these basic principles for ending the fighting in the country and insisted instead on a military resolution, with the aid and support of no other than Moscow and Tehran. How long would the new envoy last in his office as the UN special envoy to Syria is a matter of conjuncture for the time being, but all indicators suggest that his fate would be no different from that of his predecessors. Of course we hope we are wrong! 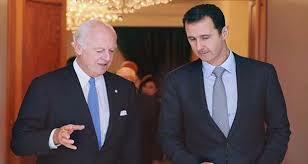 Without mentioning Assad in the article all the blame is laid on his door step. However, the actions of all foreign ‘players’ are not mentioned. Let’s face it: all the foreign players from the USA (openly), Israel (hidden), Iran, Saudi, Turkeyand others – they are happy to be there and do not want to leave. There is the main problem. Without outside support for the various groups the ‘civil war’ would have ended a long time ago.